The Urban Teacher Residency Partnership Program (UTRPP) at the University of South Florida has adopted a video-based classroom observation platform to help student teachers share videos with mentor coaches. The UTRPP integrates coursework and fieldwork, giving teacher residents more than 2,000 hours of mentoring in K–5 classrooms at six urban elementary schools in Hillsborough County Public Schools. Teacher residents in the program record their classroom instruction and upload the videos to share with university faculty, who then view the videos and provide feedback to help the residents improve their teaching practice. However, they "kept running into technical issues around recording, uploading, storing, transferring, and tagging the videos," said Sarah van Ingen, co-director of the UTRPP, in a prepared statement. The team at the UTRPP wanted to resolve these issues so they could expand their use of video coaching, which has proven to be a powerful tool in the teacher training process, according to van Ingen. "A signature pedagogy in our clinically-rich program has been our use of video as part of our content coaching cycles with our residents," she said. 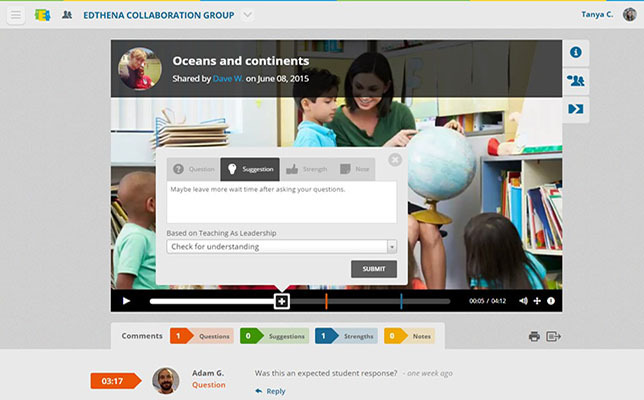 The UTRPP adopted the Edthena video-based classroom observation platform, which lets the teacher residents record themselves in the classroom using any video camera and then upload the video and securely share it with a coach. The coach can then provide timestamped comments categorized as questions, suggestions, strengths and notes. The platform also includes tools for storing and organizing videos throughout each semester.